Maira Kalman has been reading books while sitting on, under, or near trees for more than 50 years. She is the author and/or illustrator of 20 books for adults and children and is a frequent contributor to The New Yorker and the New York TImes. She worked with her husband, the late Tibor Kalman, founder of M&Co, creating all manner of design, including its famed watches. (M&Co products are currently distributed by The Museum of Modern Art.) She has also designed fabrics for Maharam and Isaac Mizrahi, accessories for Kate Spade, and dance sets for Mark Morris. 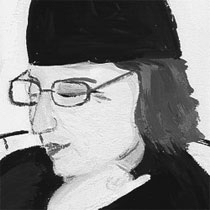 Maira Kalman is represented by the Julie Saul Gallery in New York. A retrospective of her work, “Maira Kalman: Various Illuminations (of a Crazy World),” originated by the Institute of Contemporary Art, University of Pennyslvania, completed its tour with a run at The Jewish Museum in New York, ending in July 2011.